Special thank you to my friend, Cate, for sending me this article. The New York Times did a great piece on the street food of Bali. 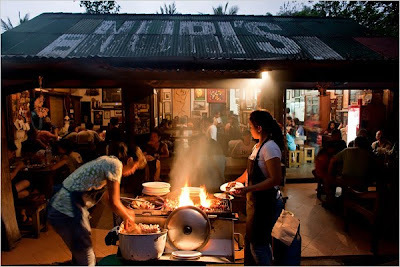 The top stop featured was Naughty Nuri's in Ubud run by a Javanese wife and an American husband. Naughty Nuri's is known for it's sushi night on Thursdays and their martinis. Dinner costs about 50,000 Rupiah for two people. 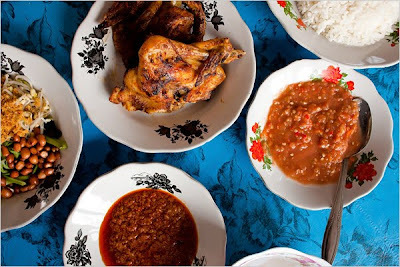 Ayam Taliwang, located in Gianyar, is known for their sweet, grilled chicken. Cost around 30,000 Rupiah. Ibu Oka, located in Ubud, is known for their babi guleng. A popular Balinese dish of suckling pig. Cost around 25,000 Rupiah for lunch. Warung Merta Sari, located in Dawan, is known for their sate lilit ikan, a fish satay. Cost about 25,000 Rupiah. The current exchange rate is around 1 USD to 9,300 Rupiah. Read about all four locations to HERE. Images taken from HERE.